As a Kenyan small holder farmer and farmer leader, I speak on behalf of my colleagues when I say we feel disregarded by our leaders except during campaign times when they need our votes! On numerous occasions, we have called on the government to lift the GM ban, but to no avail. Sadly, we continue being left behind by farmers in other parts of the world who have access to modern biotechnology tools. This became very real to me after visiting cotton farmers in India during a Bt cotton seeing-is-believing study tour. To say the least, the study tour was a big eye opener for me. 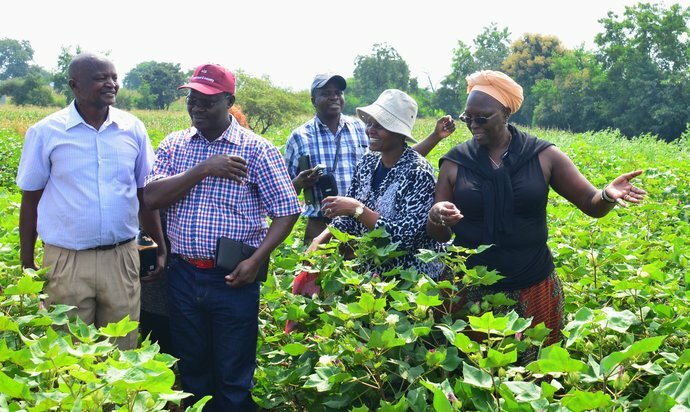 From my interactions with farmers planting Bt cotton, I was amazed to learn how much they are benefiting from this technology, and how far behind farmers in Kenya are! Leaving me to wonder – how does our government expects us to contribute to the Big Four Agenda under such circumstances? There’s no shortage of myths on modern biotechnology, especially in the grassroots. We have been led to believe that biotech crops will harm us. More specifically, in the case of India, stories of farmer suicides, linked to Bt cotton, have circulated through various platforms, causing anger, fear and panic among farming families and the public at large. However, from my experience, I can testify that these are just mere falsehoods and could not be further from the truth! For instance, during our visit to various farmers’ fields in Aurangabad, central India, where suicide cases are purported to be rampant, I had the pleasure of meeting with very progressive farmers who narrated positive stories of how Bt cotton had increased their income and improved their livelihood. The safety concerns surrounding Bt technology are not based on facts, but driven by fear! In India, processing of seed oil and cake for animal feed is big business. Oil from Bt cotton contributes to around 20% of the country’s total edible oil and sells at a premium price. We learnt that safety issues of cotton oil and cake in India are more about a substance produced by the cotton plant called gossypol, than whether the cotton is Bt or not! Farmers narrated of improved health benefits due to reduced number sprays, from 12 to 3 applications per season. This they said, was also increasing their returns as it resulted in less inputs. I was keen to find out if farmers had challenges accessing seed, as is commonly alleged. I found that this is not a challenge whatsoever. In fact, I came across very knowledgeable small-scale farmers, in Telangana State, in southern India, with vast experience on hybrid seed production, thanks to local participatory breeding programs. Various seed companies offer farmers a variety of hybrids with different characteristics, expanding their choice of seed. The world is moving on and using biotechnology to revolutionize farming. We Kenyan farmers are getting left behind, meaning we cannot compete with farmers from countries like India. Ninety three percent of the cotton in India is Bt cotton, with 7.5 million small holder farmers planting it on about 11.4 million hectares. This is a key contributor to the country’s leading position as the largest cotton producer, globally. To propel Kenya to this level, our government needs to borrow heavily from India, and start by lifting the GM ban so that we can exploit the cotton oil and seed-cake business. We need to think beyond just reviving the textile industry, and exploit other areas where this important cash crop can benefit us and the country. In addition, Bt cotton will create jobs for our children and help us revive our ginneries, which were once a source of income for many farming families, but are now lying dormant, due to lack of raw materials. From what we learnt, the AGOA market could soon slip through our hands if we do not meet local raw material demand. Our government must put all efforts to safe guard this important trade agreement. It was evident that government support for cotton farmers played a big role towards the success we witnessed in India. For instance, farmers who wish to irrigate their cotton fields are provided with a 30% subsidy by the government for drip irrigation, and construction of water harvest points for those who wish to harvest water during monsoon seasons. This is in addition to exempting farmers from paying taxes. In terms of market channels for cotton produce, Indian government has set minimum price to protect farmers and ensure they break even. These government-led efforts have motivated farmers to plant sizeable areas of cotton. Our leaders must step in and support us if we are to realize India’s level of success, and contribute towards the Big Four agenda. We are ready to work. Our lands are set, awaiting an opportunity to plant Bt cotton and revive the once thriving textile industry. But our leaders must be led by facts and be bold enough to put the right policies in place. They need to give us a chance.